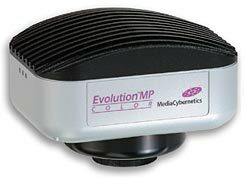 The Evolution MP camera delivers unsurpassed interactivity and productivity by combining ultra high resolution images with video-like, full field of view frame rates of up to 30fps. Scanning, framing and focusing have never been easier than with the Evolution MP. The 30-bit color digitization produces high quality images of brightfield, dark-field and fluorescence work. The complete ultra high resolution field of view captured by the full 5.0 million pixels on the sensor reduces the chance of image artifacts or lost information. This camera also ensures that preview and capture speed are not sacrificed, as it provides a variety of selectable resolution options and capture speeds to suit many applications. The Evolution MP includes the convenience of a FireWire (IEEE 1394) digital interface and is available in an optional thermoelectric cooling at ten degrees below ambient.